Here are five games that need to be on your radar screen if you want to win your NFL pick’em contest or confidence pool. Remember: Getting the biggest edge in your NFL pick’em requires a precise evaluation of every team’s win odds (i.e. how risky of a pick it is) as well as its pick popularity (i.e. how much you’ll gain in the standings if you pick a team and it wins). Then, you need to make sure the overall risk/reward profile of your weekly picks is appropriate for your specific pool’s characteristics — it’s size, rules, prize structure, etc. Our Football Pick’em Picks is the only product on the market that does all of this analysis for you, and customizes weekly pick recommendations for your specific pool(s). Last season, 81% of TeamRankings subscribers reported winning a weekly or season prize in a football pick’em contest using our Football Pool Picks. You can also check out our NFL survivor pool picks and NFL betting picks. This week’s analysis of win odds and pick popularity yields five picks of particular interest for NFL picks contests and confidence pools. Note that we are not saying you should make all of these picks. The best picks for your specific pool depend on a number of different strategy factors, such as the number of entries in your pool; whether it uses confidence points; and whether it offers season prizes, weekly prizes, or both. Still, deciding which way you want to go on the five games below should be top of mind when you make your NFL Week 2 picks. Note: Win odds and projected pick popularity data quoted below may change between publication time and kickoff time. 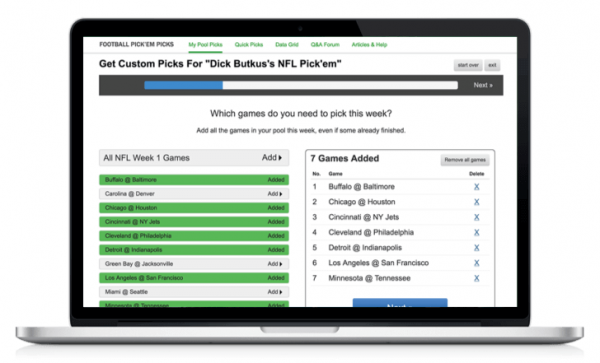 Our Football Pick’em Picks product updates multiple times per day with the latest information. After pulling away in the second half and handily covering a six-point spread at Oakland on Monday night, the Rams return home as Week 2’s biggest Vegas favorite. LAR is favored by 13 points against an Arizona team that, despite closing as a 2-point favorite last week, lost by 18 to Washington. As such a huge favorite, LAR’s win odds (over 85%) aren’t that much lower than its pick popularity (95%), so considering Arizona as a big upset pick doesn’t make much sense. If you’re hell bent on making a big Week 2 upset pick, you’d do better from a risk/reward standpoint picking against one of the other bigger favorites of the week. “Recency bias” value opportunities often present themselves in Week 2, when many NFL fans are simply overreacting to opening week results. In many public minds, the Chiefs went on the road and shocked the Chargers with a 38-28 upset, and young QB Patrick Mahomes was an absolute stud (4 TDs, 0 INTs). Meanwhile, all the Steelers managed to do was tie the lowly Browns in OT, and are missing one of their best players in RB Le’Veon Bell. The facts are more nuanced, though. The Chiefs likely benefited from a bit of luck, winning the turnover battle 2-0, while the Browns are probably going to be better than most people think. The bottom line is that in this game Pittsburgh is a 5-point Vegas favorite, at home, with win odds (68%) higher than its pick popularity (63%). Especially earlier in the year, it makes sense to stick with the favorite here. Chicago outperformed expectations at Green Bay on Sunday night, and was on course for an upset victory until giving up a 75-yard TD pass with under three minutes left in the game. Early-week lines have the Bears as a 3.5-point favorite in this game, crossing an important threshold after opening as 3-point favorites. Seattle lost to Denver by three, as expected by Vegas, but also lost the yardage battle to the Broncos 470-306. In short, this is a matchup between a recently bad team expected to improve this season (Chicago), and a recently good team expected to decline (Seattle), and last week’s results didn’t provide much evidence to the contrary. Despite the Bears having over 60% win odds, only 50% of the public is picking them. If those numbers hold, Chicago looks like a great value pick across almost all types of pick’em pools. It felt like the Ravens beat the hapless Bills 100-0 last week (in reality only 47-3), so it’s no surprise that nearly two-thirds of the public is picking Baltimore in this game. However, an efficient passing game and fourth quarter rally helped Cincinnati notch a road upset at Indianapolis last week, and the Vegas line for this game has been bouncing around “Pick’em” (i.e. even game) in the early going. Most recently, Cincinnati had moved to being a 1-point favorite. With the public all over Baltimore, in a very close game like this you’re almost always better off picking the less popular team, especially if the Bengals are still a slight favorite when your pool picks are due this week. Even if Baltimore is the better team, winning on the road in the NFL is never a given. The “obvious” game last week apparently wasn’t so obvious, as the 10-point underdog Bucs opened up a 48-24 lead over New Orleans and then held on for a big upset win. There’s certainly an argument that this performance may prove to be a fluke; Tampa Bay won the turnover battle 2-0, backup QB Ryan Fitzpatrick played the game of his life (417 yards passing, 4 TDs, 0 INTs), and the Bucs benefitted from several long TD passes. At the same time, the Eagles were less than impressive, to say the least, in eeking out a home win in a snoozer against the Falcons. Banged up Philadelphia is still the Vegas favorite in this game, but only by three points. The public, on the other hand, is picking Philly to win at more than an 80% clip, which values the Eagles as more like 9-point favorites. That’s quite a discrepancy, so if you’re looking for a riskier value upset pick that is especially well suited for pools that only offer weekly prizes, Tampa Bay is probably your best bet this week. Which Of These Five NFL Week 2 Picks Should You Make? Maybe all of them, maybe most of them. We’re not dodging the question — the reality is, it takes a lot of math to get to the right answer. We built our Football Pick’em Contest Picks to do all this number crunching for you. You answer a few quick questions about your pool, and it customizes weekly pick recommendations to give you the biggest edge. We use data from national pick’em contests to estimate pick popularity for every team. We compare a team’s pick popularity to its win odds (or point spread cover odds, if you’re in a point spread pool) to determine if it’s being underrated or overrated by the public. Finally, we use algorithms to identify the exact set of picks each week that offers the best risk vs. reward profile for your pool. The result? In our postseason survey last year, 81% of our subscribers reported winning a weekly or a season prize in a football pick’em contest. And don’t forget about our NFL Survivor Picks and NFL Betting Picks too.